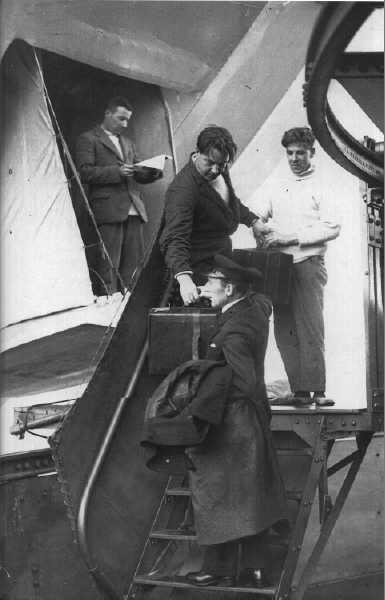 On 4th October the R101 was loaded up for her voyage to the Imperial Conference in India. The list below shows the passengers and crew members on this final voyage. 1. Brigadier-General, The Right Hen. Lord Thomson of Cardington (HM Secretary of State for Air) - killed; not identified. 2. Air Vice-Marshal Sir W. Sefton Brancker (Director of Civil Aviation)- killed; identified on return to London. 3. Major Percy Bishop (Chief Inspector AID)- killed; not identified. 4. Squadron Leader W Palstra RAAF (representing the Australian Government) - killed; not identified. 5. Squadron Leader W O'Neill (Deputy Director of Civil Aviation, India) - killed; identified on return to London. 6. Mr James Buck, Lord Thomson's valet - killed; identified on return to London. 7. Wing Commander R.B.B. Colmore (DAD)- killed; identified on return to London. 8. Major G.H. Scott (ADAD Flying)- killed; not identified. 9. Lt.Col. V.C. Richmond (ADAD Technical)- killed; identified on return to London. 10. Squadron Leader EM. Rope (Assistant to DAD Technical) - killed; identified on return to London. 11. Mr Alexander Bushfield, AID - killed, identified on return to London. 13. Flight Lieutenant H. Carmichael Irwin (Captain)- killed; identified on return to London. 14. Squadron Leader E.L. Johnston (Navigator)- killed; not identified. 15. Lt-Commander N.G. Atherstone (First Officer) - killed; identified on return to London. 16. Flying Officer M.H. Steff (Second Officer)- killed; not identified. 17. Mr M.A. Giblett (Chief Meteorological Officer) - killed; identified on return to London. 18. G.W. Hunt (Chief Coxswain) - killed; not identified. 19. W.R. Gent (Chief Engineer) - killed; identified on return to London. 20. G.W Short (Charge-Hand Engineer)- killed; not identified. 21. S.E. Scott (Charge-Hand Engineer) - killed; identified at Allonne. 22. T. Key (Charge-Hand Engineer)- killed; not identified. 23. S.T. I(eeley (Chief Wireless Operator) - killed; not identified. 24. A.H. Savidge (Chief Steward) - killed; not identified. 25. Flight-Sergeant WA. Potter (Assistant Coxswain) - killed; identified at Allonne. 26. L.E Oughton (Assistant Coxswain) - killed; identified on return to London. 27. C.H. Mason (Assistant Coxswain) - killed; not identified. 28. M.G. Rampton (Assistant Coxswain)- killed, identified on return to London. 29. H.E. Ford (Assistant Coxswain)- killed; not identified. 30. P.A. Foster (Assistant Coxswain) - killed; not identified. 31. E.G. Rudd (Rigger) - killed; identified at Allonne. 32. C.E. Taylor (Rigger) - killed; identified on return to London. 33. A.W.J. Norcott (Rigger) - killed; not identified. 34. A.J. Richardson (Rigger)- killed; identified on return to London. 35. WG. Radcliffe (Rigger)- survived, but died at Beauvais on October 6th. 36. S. Church (Rigger)- survived, but died at Beauvais on October 8th. 37. R. Blake (Engineer)- killed; identified at Allonne. 38. C.A. Burton (Engineer)- killed; identified on return to London. 39. C.J. Fergusson (Engineer) - killed; not identified. 40. A.C. Hastings (Engineer) - killed; not identified. 41. W.H. King (Engineer) - killed; identified on return to London. 42. M.E Littlekitt (Engineer) No. 1 car - killed; not identified. 43. W Moule (Engineer) No. 2 car - killed; identified on return to London. 44. A.H. Watkins (Engineer) - killed; not identified. 45. A.V. Bell (Engineer) No. 5 car - survivor. 46. T.H. Binks (Engineer) No. 5 car - survivor. 48. V. Savory (Engineer) No. 3 car - survivor. 49. G.H. Atkins (Wireless Operator) - killed; identified on return to London. 50. E Elliott (Wireless Operator) - killed; identified on return to London. 51. A. Disley (Wireless Operator/Electrician) - survivor. 52. F Hodnett (aka J.Curran) (Assistant Steward) - killed; not identified. 53. E.A. Graham (Cook) - killed; not identified. 54. T.W Megginson (Galley Boy) - killed, not identified. Copyright © 2019 Airship Heritage Trust. All Rights Reserved. Copying and/or redistributing of any files is illegal under international copyright law. AHT is not responsible for the content of external sites.